This part of the book is intended to act as a guide to the basic technological principles that are specific to landers, penetrators and atmospheric-entry probes, and to act as a pointer towards more detailed technical works. The chapters of this part aim to give the reader an overview of the problems and solutions associated with each sub-system/flight phase, without going into the minutiae. Before journeying through the various specific engineering aspects, it is worth examining two important subjects that have a bearing on many more specific activities later on. First we consider systems engineering as the means to integrate the diverse constraints on a project into a functioning whole. We then look at the choice of landing site for a mission, a decision often based on a combination of scientific and technical criteria, and one that usually has a bearing on the design of several sub-systems including thermal, power and communications. Engineering has been frivolously but not inaptly defined as 'the art of building for one dollar that which any damn fool can build for two'. Most technical problems have solutions, if adequate resources are available. Invariably, they are not, and thus skill and ingenuity are required to meet the goals of a project within the imposed constraints, or to achieve some optimum in performance. Systems engineering may be defined as the art and science of developing an operable system capable of meeting mission requirements within imposed constraints including (but not limited to) mass, cost and schedule. The modern discipline of systems engineering owes itself to the development of large projects, primarily in the USA, in the 1950s and 1960s when projects of growing scale and complexity were undertaken. Many of the tools and approaches derive from operational research, the quantitative analysis of performance developed in the UK during World War II. Engineering up to that epoch had been confined to projects of sufficiently limited complexity that a single individual or a team of engineers in a dominant discipline could develop and implement the vision of a project. As systems became more sophisticated, involving hundreds of subcontractors, the more abstract art of managing the interfaces of many components became crucial in itself. A general feature is that of satisfying some set of requirements, usually in some optimal manner. To attain this optimal solution, or at least to satisfy as many as possible of the imposed requirements, usually requires tradeoffs between individual elements or systems. To mediate these tradeoffs requires an engineering familiarity and literacy, if not outright talent, with all of the systems and engineering disciplines involved. Spacecraft represent particularly broad challenges, in that a wide range of disciplines is involved - communications, power, thermal control, propulsion and so on. Arguably, planetary probes are even more broad, in that all the usual spacecraft disciplines are involved, plus several aspects related to delivery to and operation in planetary environments, such as aero-thermodynamics, soil mechanics and so on. While engineers usually like to plough into technical detail as soon as their task is defined, it is important to examine a broad range of options to meet the goals. As a simple example, a requirement might be to destroy a certain type of missile silo. This in turn requires the delivery of a certain overpressure onto the target. This could be achieved, for example, by the use of a massive nuclear warhead on a big, dumb missile. Or one might attain the same result with a much smaller warhead, but delivered with precision, requiring a much more sophisticated guidance system. Clearly, these are two very different, but equally valid, solutions. It is crucial that the requirements be articulated in a manner that adequately captures the intent of the 'customer'. To this end, it is usual that early design studies are performed to scope out what is feasible. These usually take the form of an assessment study, followed by a Phase A study and, if selected, the mission proceeds to Phases B and C/D for development, launch and operation. During the early study phases a mission-analysis approach is used prior to the more detailed systems engineering activity. Mission analysis examines quantitatively the top-level parameters of launch options, transfer trajectories and overall mass budget (propellant, platform and payload), without regard to the details of subsystems. In the case of a planetary probe, the usual mission is to deliver and service an instrument payload for some particular length of time, where the services may include the provision of power, a benign thermal environment, pointing and communications back to Earth. The details of the payload itself are likely to be simply assumed at the earliest stages, by similarity with previous missions. Such broad resource requirements as data rate/volume, power and mass will be defined for the payload as a whole. These allow the design of the engineering system to proceed, from selecting among a broad choice of architectures (e.g. multiple small probes, or a single mobile one) through the basic specification of the various subsystems. The design and construction of the system then proceeds, usually in parallel with the scientific payload (which is often, but not always, developed in institutions other than that which leads the system development), perhaps requiring adaptation in response to revised mission objectives, cost constraints, etc. Changes to a design become progressively more difficult and expensive to implement. The development team will include a number of specialists dedicated to various aspects of the project, throughout its development. In many organizations, additional expertise will additionally be co-opted on particular occasions (e.g. for design reviews, or particularly tight schedules). The project will be led by a project manager, who must maintain the vision of the project throughout. The project manager is the single individual whose efforts are identified with the success or otherwise of the project. The job entails wide (rather than deep) technical expertise, in order to gauge the weight or validity of the opinions or reports of various subsystem engineers or others and to make interdisciplinary tradeoffs. The job requires management skills, in that it is the efforts of the team and contractors that ultimately make things happen - areas where members of the team may variously need to be motivated, supported with additional manpower, or fired. Meetings may need to be held, or prevented from digressing too far. And this demanding job requires political skill, to tread the compromise path between constraints imposed on the project, and the capabilities required or desired of it. A broadly similar array of abilities, weighted somewhat towards the technical expertise, is required of the systems engineer, usually a nominal deputy to the project manager. A major job for the systems engineer is the resolution of technical tradeoffs as the project progresses. Mass growth, for example, is a typical feature of a project development - mass can often be saved by using lighter materials (e.g. beryllium rather than aluminium), but at the cost of a longer construction schedule or higher development cost. A team of engineers devoted to various aspects of the project, from a handful to hundreds, will perform the detailed design, construction and testing. The latter task may involve individuals dedicated to arranging the test facilities and the proper verification of system performance. Where industrial teams are involved, various staff may be needed to administer the contractual aspects. Usually the amount of documentation generated is such as to require staff dedicated to the maintenance of records, especially once the project proceeds to a level termed 'configuration control', wherein interfaces between various parts of the project are frozen and should not be changed without an intensive, formal review process. In addition to the hardware and software engineers involved in the probe system itself, several other technical areas may be represented to a greater or lesser extent. Operations engineers may be involved in the specification, design, build and operation of ground equipment needed to monitor or command the spacecraft, and handle the data it transmits. There may be specialists in astro-dynamics or navigation. Finally, usually held somewhat independently from the rest of the team, are quality-assurance experts to verify that appropriate levels of reliability and safety are built into the project, and that standards are being followed. In scientific projects there will be a project scientist, a position not applicable for applications such as communications satellites. This individual is the liaison between the scientific community and the project. In addition to mediating the interface between providers of the scientific payload and the engineering side of the project, the project scientist will also coordinate, for example, the generation or revision of environmental models that may drive the spacecraft design. The scientific community usually provides the instruments to a probe. The lead scientist behind an instrument, the principal investigator (PI), will be the individual who is responsible for the success of the investigation. Usually this means procuring adequate equipment and support to analyse and interpret the data, as well as providing the actual hardware and software. An instrument essentially acts as a mini project-within-a-project, with its own engineering team, project manager, etc. For the last decade or so, NASA has embraced so-called PI-led missions, under the Discovery programme. Here a scientist is the originator and authority (in theory) for the whole mission, guiding a team including agency and industry partners, not just one experiment. This PI-led approach has led to some highly efficient missions (Discovery missions have typically cost around $300M, comparable with the ESA's 'Medium' missions) although there have also been some notable failures, as with any programme. The PI-led mission concept has been extended to more expensive missions in the New Frontiers line, and for Discovery-class missions in the Mars programme, called 'Mars Scout'. A further class of mission deserves mention, namely the technology-development or technology-validation mission. These are intended primarily to demonstrate and gain experience with a new technology, and as such may involve a higher level of technical risk than one might tolerate on a science-driven mission. Some missions (such as those under NASA's New Millenium programme, notably the DS-2 penetrators) are exclusively driven by technology goals, with a minimal science payload (although often substantial science can be accomplished even with only engineering sensors). In some other cases, the science/technology borderline is very blurred - one example is the Japanese Hayabusa asteroid sample return: this mission offers a formidable scientific return, yet was originally termed MUSES-C (Mu-launched space-engineering satellite). Whatever the political definitions and the origin of the mission requirements, it must be recognized that there is both engineering challenge and science value in any spacecraft measurement performed in a planetary environment. A dynamic tension usually exists in a project, somewhat mediated by the project scientist. Principal investigators generally care only about their instrument, and realizing its maximum scientific return, regardless of the cost of the system needed to support it. The project manager is usually confronted with an already overconstrained problem - a budget or schedule that may be inadequate and contractors who would prefer to deliver hardware as late as possible while extorting as much money out of the project as possible. One tempting way out is to descope the mission, to reduce the requirements on, or expectations of, the scientific return. Taken to the extreme, however, there is no point in building the system at all. Or a project that runs too late may miss a launch window and therefore never happen; a project that threatens to overrun its cost target by too far may be cancelled. So the project must steer a middle path, aided by judgement and experience as well as purely technical analysis - hence the definition of systems engineering as an art. Technical constraints are likely to exist on both the delivery of the probe or lander, and on its long-term operation. First we consider the more usual case where the probe is delivered from a hyperbolic approach trajectory, rather than a closed orbit around the target. The astrodynamic aspects of arrival usually specify an arrival direction, which cannot be changed without involving a large delivered-mass penalty. The arrival speed, and the latitude of the incoming velocity vector (the 'asymptote', or unperturbed by the target's gravity, is usually considered) are hence fixed. Usually the arrival time can be adjusted somewhat, which may allow the longitude of the asymptote to be selected for sites of particular interest, or to ensure the landing site is visible from a specific ground station. Occasionally this is fixed too, as in the case of Luna 9 where the descent systems would not permit any horizontal velocity component - the arrival asymptote would only be vertical at near-equatorial landing sites around 64°W. The target body is often viewed in the planning process from this incoming Vl the plane going through the centre of the target body orthogonal to that vector is often called the 'B-plane'. The target point may be specified by two parameters. The most important is often called the 'impact parameter', the distance in the B-plane between the centre and the target point. For a given target body radius (either the surface radius, or sometimes an arbitrary 'entry interface' above which aerodynamic effects can be ignored) a given impact parameter will correspond to a flight-path angle, the angle between the spacecraft trajectory and the local horizon at that altitude. This may often be termed an entry angle. Figure 1.1. Top: cartoon illustrating lander-delivery uncertainty arising from uncertainties in the state vector at deployment. Bottom: attitude and landing-error ellipses for Beagle 2 (adapted from Bauske, 2004). shallow an angle may result in a large total heat load; in the limiting case of a large impact parameter, the vehicle may not be adequately decelerated or may miss the target altogether. The entry protection performance may also introduce constraints other than simple entry angle. For the extremely challenging case of entry into Jupiter's atmosphere, the ~12.5 km s~x equatorial rotation speed is a significant increment on the entry speed of ~50 km s_1. Heat loads vary as the cube of speed, and thus by aiming at the receding edge of Jupiter (i.e. the evening terminator, if coming from the Sun) the entry loads are reduced by a factor (50 + 12.5)3/(50-12.5)3 = 4.6, a most significant amelioration. The second parameter is the angle relative to the target body equator (specifically where the equatorial plane crosses the B-plane) of the impact parameter. A B-plane angle of zero is on the equator; 90° means the entry point falls on the central meridian as seen from the incoming vector. Figure 1.2. View of Titan from the arrival asymptote of the Huygens probe, with overlapping annuli reflecting the constraints on entry angle (light grey) and solar elevation (darker grey). Of the choice of two target locations where the regions overlap (A and B), only A accommodates the probe's delivery ellipse. Other constraints include the communication geometry - if a delivery vehicle is being used as a relay spacecraft, it may be that there are external constraints on the relay's subsequent trajectory (such as a tour around the Saturnian system) which specify its target point in the B-plane. Targeting the flyby spacecraft on the opposite side of the body from the entry probe may limit the duration of the communication window. Current NASA missions after the Mars mission failures in 1999 now require mission-critical events to occur while in communication with the Earth: thus entry and landing must occur on the Earth-facing hemisphere of their target body. Another constraint is solar. The entry may need solar illumination for attitude determination by a Sun sensor (or no illumination to allow determination by star sensor! ), or a certain amount of illumination at the landing site for the hours following landing to recharge batteries. These aspects may influence the arrival time and/or the B-plane angle. So far, the considerations invoked have been purely technical. Scientific considerations may also apply. Optical sensing, either of atmospheric properties, or surface imaging, may place constraints on the Sun angle during entry and descent. Altitude goals for science measurements may also drive the entry angle (since this determines the altitude at which the incoming vehicle has been decelerated to parachute-deployment altitude where entry protection - which usually interferes with scientific measurements - can be jettisoned). The entry location (and therefore 'landing site') for the Huygens probe was largely determined by the considerations described so far (at the time the mission was designed there was no information on the surface anyway). 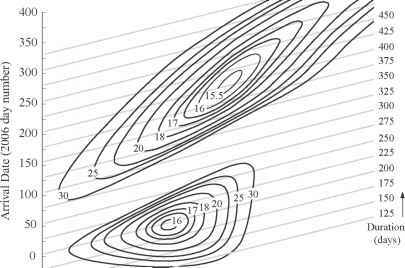 The combination of the incoming asymptote direction and the entry angle defined an annulus of locations admissible to the entry system. The Sun angles required for scientific measurements of light scattering in the atmosphere, and desired shadowing of surface features defined another annulus. These two annuli intersected in two regions, with the choice between them being made partly on communications grounds. There may be scientific desires and technical constraints on latitude. Latitude may be directly associated with communication geometry and/or (e.g. in the case of Jupiter), entry speed. For Mars landers in particular, the insolation as a function of latitude and season is a crucial consideration, both for temperature control and for solar power. Many Mars lander missions are restricted to 'tropical' landing sites in order to secure enough power. So far, the planet has been considered only as a featureless geometric sphere. There may be scientific grounds for selecting a particular landing point, on the basis of geological features of interest (or sites with particular geochemistry such as polar ice or hydrated minerals), and, depending on the project specification, these may be the overriding factor (driving even the interplanetary delivery trajectory). A subtle geographical effect applies on Mars, where there is extreme topographical variation - of order one atmospheric scale height. Thus selecting a high-altitude landing site would require either a larger parachute (to limit descent rate in the thinner atmosphere), or require that the landing system tolerate higher impact speed. 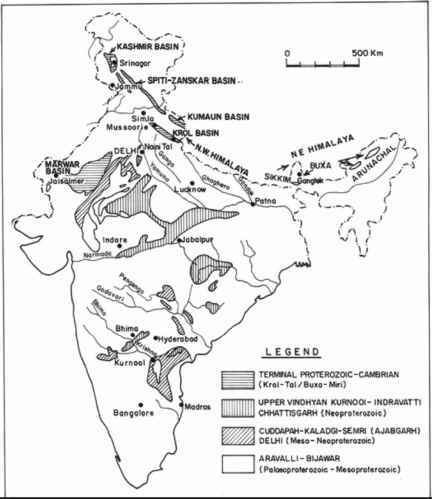 The landing sites for the Mars Exploration Rover missions (MER-A and -B) were discussed extensively (Kerr, 2002). The not-infrequent tradeoff between scientific interest and technical risk came to the fore. As with the Viking landing site selection, the most scientifically interesting regions are not the featureless plains preferred by spacecraft engineers. The situation is complicated by the incomplete and imperfect knowledge of the landing environment. One constraint was that the area must have 20% coverage or less by rocks 0.5 m across or larger that could tear the airbags at landing. Rock distributions can be estimated from radar techniques, together with geological context from Mars orbit (while rocks cannot be seen directly, geological structures can - rocks are unlikely to be present on sand dunes, for example), and thermal inertia data. Although there are no direct wind measurements near the surface in these areas, models of Martian winds are reaching reasonable levels of fidelity, and these models are being used to predict the windspeeds at the candidate landing sites. Winds of course vary with season (e.g. the Martian dust-storm season, peaking soon after solar longitude Ls = 220°, is best avoided!) and time of day. The Pathfinder lander, for example, landed before dawn, at 3 a.m. local solar time, when the atmosphere was at its most stable. The MER had an imperative (following on in turn from the Mars Polar Lander failure) that it must be in communication with the Earth during its descent and landing. This requires that it land in the afternoon instead - when winds are strongest! Here, perversely, a politically driven engineering uncertainty introduces a deterministic (i.e. certain!) increase in risk. On Earth, a handful of landing sites are used. The US manned missions in the 1960s and 1970s relied upon water landing; the mechanical properties of the ocean are well understood and uniform over some 60% of the globe, with the only variable being uncertain winds and sea state. Other missions (unmanned capsules and Russian manned missions) have landed on large flat areas, notably the Kazakhstan steppe, and Utah was used for the Genesis solar wind and Stardust comet-sample-return missions. A significant factor in the choice of landing is the accuracy with which the capsule can be targeted (oceans may be less desirable landing sites, but they are hard to miss) and whether a particularly rapid retrieval (e.g. for frozen comet samples) is required. A final possibility, and a good example of systems engineering in action, is to avoid the landing problem altogether by retrieving the payload during its parachute descent. This approach was used for the film capsules in US Discoverer reconnaissance satellites, which were recovered by snaring the parachute lines with a frame suspended from a transport aircraft. The choice of this system may have been dictated partly by strategic concerns, rather than an EDL optimization from purely mass-performance considerations, but it nevertheless remains an option. One way of reducing the importance of the landing-site selection problem is to provide mobility. This may pertain both to the landing itself, and operations after landing. In terms of landing, the scale of feature that poses a hazard is comparable with that of the vehicle itself - landing on a half-metre sharp rock could dent a structure, puncture an airbag, or cause a tilt on a lander that might cripple its ability to generate power or communicate with Earth. However, such small features cannot currently be imaged from orbit, nor can an unguided entry and descent system be assured of missing it. Such precision landing requires closed-loop control during the descent. Such guidance may require imaging or other sensing (a simple form of on-board image analysis was performed on the Mars Exploration Rovers, in order to determine the sideways drift due to winds, and apply a rocket impulse just prior to landing in order to suppress the sideways motion and the resultant loads on the airbag landing system). A technique that has been explored for Mars precision landing, and landing on small bodies such as asteroids, is LIDAR or laser ranging. This is able to produce a local high-resolution topographic map around the immediate landing area. The actuation involved in such precision landing may involve small thrusters, or conceivably steerable parachutes. Clearly, if the goal is to analyse a rock with some instrument, the designer may equip a lander with a long, powerful arm that can bring the rock to the instrument. Or, the instrument may be brought to the rock, perhaps on a mobile vehicle (see Chapter 12). Whether an arm is used, or a rover, their positions need to be controlled, and their positions (and that of the rock) need to be known. In general, ground-based analysis of image data is used for these tasks. However, goniometry (the measurement of arm position by recording joint rotations) and dead-reckoning (measuring the number of turns of a rover wheel) can permit some on-board autonomy. The latter suffers, especially on steep slopes of loose material, from wheel slippage - the wheel may turn without moving the vehicle forward. Closed-loop navigation using on-board analysis of image data is beginning to find a role here. Additionally, crude hazard identification can be performed with structured light - such as a pattern of laser lines on the scene, which allows the ready identification of rocks or holes. A cartoon, uppermost in Figure 1.1, shows how the body axes of a spacecraft are offset from a fixed inertial frame, and known to varying levels of accuracy. The landing site of an entry craft will vary as a result of uncertainties in the location of the combined spacecraft prior to release, and the path taken by the landing craft after ejection. This is illustrated in the lower two charts of Figure 1.1. The left-hand plot shows how the uncertainty in attitude of a Mars entry craft at a nominal altitude of 100 km varies as a result of different factors. In the right-hand plot, the landing footprint of the craft takes on an elliptical form, with the major axis of this error ellipse being dictated by uncertainties in ejection speed, cruise time from ejection to impact, and variability in aeroshell drag, amongst other effects. A similar (although numerically different) problem confronted the Huygens probe. 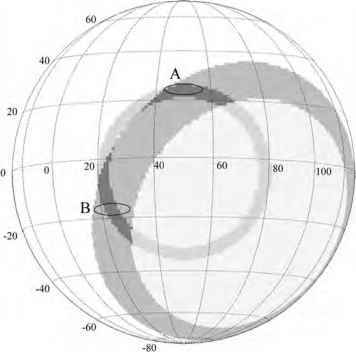 The choice of entry location is driven by several considerations: Figure 1.2 shows Titan's globe as seen from an incoming asymptote - in this case centred at 5°S, 50°E longitude. First, the entry angle must lie in a specified range of for example 60°-65°, denoted by the lightest grey circle. Second, certain optical instruments require the Sun (here at 80° longitude, 24°S) to lie between 30° and 45° elevation as seen from the descending probe -this locus is denoted by the intermediate grey ring. The intersection of the two is shown by the dark grey areas - thus there is a choice of two target regions. The delivery ellipse is shown centred on the two target locations. In general, the ellipse is narrow, one direction (often that associated with time of arrival) being typically larger than the other. This corresponds somewhat to the uncertainty of the spacecraft or target ephemeris and thus here the long axis of the ellipse is E-W. It can be seen that only one of the two sites (A) is acceptable. At (B) the delivery uncertainty is such as to allow an unacceptable probability that the entry angle corridor would be violated. At (A) the long axis of the delivery ellipse is aligned with the long axis of the acceptable entry region and thus success is assured. The challenges involved in designing optimal trajectories for planetary landers or atmospheric probes are shared by many other types of spacecraft projects. Spacecraft, at least for the foreseeable future, have to be launched from the Earth's surface and then placed on a path that intersects the orbit of the target body. How this is achieved depends on the mission of the spacecraft and its associated cost and design details. Spacecraft have been delivered to space on a wide variety of launchers, all of which subject their payloads to different acoustic, dynamic and thermal regimes. These parameters vary with the size and nature of the launcher, yet the complex launch vehicle industry often makes it difficult to isolate a preferred launcher type for a given mission. In Table 2.1 pertinent features of current launch vehicles are shown with data taken from their user manuals; the launcher market currently has over a dozen vehicles capable of lifting interplanetary payloads. Costs are not listed as many of the vehicles offer dual manifest capability, or other partial-occupancy accommodation (such as Ariane's ASAP) which can make heavy launchers and their capability available to even modestly funded missions. originating at Earth's orbit, with a C3 of 10 km2 s 2, are characteristic of Mars missions, with a C3 of 50 through 100 km2 s~2 being representative of direct transfers to the outer planets. Realistic missions to such distant targets would endeavour to use more energy-efficient routes by the use of gravitational assists, and so the payload figures in Table 2.1 for such large C3 values are notional only. Missions to the Moon generally, by definition, have negative C3 values (around —2 km2 s—2), as hyperbolic escape never occurs. It can be appreciated that for greater speed changes, and larger C3 values, heavier and more expensive launchers are needed to deliver a given mass; this is shown concretely in the rocket equation described below. This is the first major tradeoff in a mission's design process as money is often the key finite resource in a mission, and so it is necessary to consider how a spacecraft or its mission could be resized so that a cheaper, and usually less flexible or less powerful, launcher can be used. Rocket propulsion is the sole present means of producing the large speed changes associated with interplanetary travel. Although the technologies used in generating thrust can vary considerably, a rocket causes a change in speed, 1V, that depends on the fractional amount of mass that is ejected and the rocket's efficiency, the specific impulse, Isp. Usually, the word 'specific' refers to a unit of mass and so Isp should be the impulse (N s) per unit mass (kg—1) and have units of speed (m s—x). For historical reasons Isp refers to a unit weight of propellant, and so the preceding definition has its value divided by the gravitational acceleration, g°, at the Earth's surface1 to give dimensions of time (s). In the following equation mi and mf are the initial and final masses of the rocket. 1 Thus, an Isp of 2943 N s kg is equal to an 7sp' (by weight) of 300 s. This last formulation is widely used. Typical Isp values for propulsion systems that have been used to inject spacecraft into interplanetary trajectories range from 300 s to 340 s for liquid bipropellant stages,2 to values of several thousand seconds for electric propulsion systems such as those used on the Deep Space 1 and Hayabusa craft. These two classes of rocket engine, chemical and electrical, have very different operating profiles. Chemical motors and engines are easily scaled to give very high thrusts with little impact on other spacecraft systems such as power generation. To give a certain impulse a chemical engine therefore needs to burn for a relatively brief period, unlike an electric propulsion system. Drives in this category, broadly, have Isp values ten times those of chemical drives, but cannot be scaled to give high thrusts without the need for commensurately large and heavy power-raising equipment. Thus, to provide the same 1V as chemical engines, electric drives are operated for much of the journey to the target body. The high thrust levels delivered by chemical propulsion systems result in manoeuvres that last for a short fraction of the total transfer-trajectory duration. The burns needed at the start and end of the transfer path can be treated as being impulsive and of infinitesimal duration. With the exception of aerocapture or impact missions, the spacecraft executes at least two manoeuvres after being launched. To make best use of the Earth's orbital speed around the Sun, the first burn results in the craft leaving the Earth's orbit at a tangent, and moving along a trajectory that is part of a conic section. That trajectory is chosen so that it intersects the target body, with 0 defined as the angle between the craft's velocity vector and the target planet's orbit. This arrangement is shown in Figure 2.1 for a craft being launched at a distance rp from the Sun. For transfer A, 0 = 0 and the path intersects only one orbit at a tangent: that of the Earth. The hodograph for the arrival point of trajectory A is shown to the right of Figure 2.1. There are infinitely many one-tangent paths between two planets, with the transfer duration and required velocity changes fixed by the major axis of the elliptical path. Two paths A and B are shown in Figure 2.1, with different aphelia; ra(A) and ra(B). 2 Such as mono-methyl hydrazine and nitrogen tetroxide, as used on the restartable Fregat transfer stage. Figure 2.1. Showing two types of transfers between planets. planet and this trajectory is known as a Hohmann transfer.3 A Hohmann trajectory has the smallest propulsive requirement of any two-burn transfer and consequently has the longest duration. Other, more energetic transfers will be faster than a Hohmann transfer, and paths that have a change in polar angle, f, less than 180° are termed type 1 paths, such as route A shown in Figure 2.1. Craft on type 2 paths (not shown) meet their targets after aphelion, and so the polar angle changes by more than 180°. In Table 2.2 the total 1V values needed to perform various transfers between the orbits of the Earth and Mars are listed, with the Hohmann transfer in the first row. These values can be readily calculated from the algorithms available in many texts on orbital mechanics. sphere of gravitational influence with a speed different from its hyperbolic escape speed at departure. Furthermore, the preceding figures were calculated for the idealized case of Earth and Mars having coplanar and non-eccentric orbits. This simplification is useful only as a guide, and in reality the launch 1V value can vary widely depending on the relative positions of the planets in their orbits. Plane-change manoeuvres are typically costly for interplanetary missions, and for small rotations of the orbit plane by 1i (radians), the 1V requirement scales as V1i. Generally plane changes are performed either as part of a launch sequence, or, later in a mission, to alter mapping coverage of an orbiter. Such manoeuvres rarely occur at interplanetary speeds, and when such alterations are needed nonimpulsive techniques such as gravity assists can be used to rotate orbit planes significantly; the classic example being the purely ballistic Jupiter flyby of the Ulysses probe that led to a near-80° rotation of the craft's orbit plane. In Figure 2.2 data for minimum, average and maximum duration Hohmann transfers are plotted for travel from the Earth to the other planets of the Solar System. The large eccentricity of Mercury's orbit reveals itself by the wide spread in spacecraft departure 1V values, although the tabulated values represent an unreasonable span as they do take into account the actual values of the arguments of perihelion of each planet. Figure 2.2. Hohmann transfers from Earth to other planets - AV (lower points) and durations (upper points) shown for shortest, average and longest trajectories. needed. In this case the shorter of the two transfers, with a C3 of around 16 km s , has a duration of ~175 days and is a type 1 path. The second transfer, a type 2 path, lasts almost twice as long but saves 0.5 km2 s~2 in C3, which corresponds to a difference in speed at Earth departure of ~6ms_1. Figure 2.3. A 'pork-chop' plot for a notional transfer trajectory to Mars, showing contours of cruise duration (grey) and C3 values (black), the latter showing two minima. Figure 2.4. 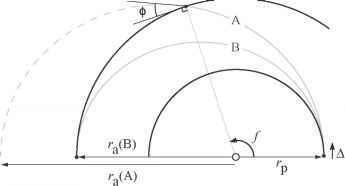 The geometry of a close flyby path in the planetocentric inertial frame. used in this way, the spacecraft enters and leaves its influence with the same speed. However, the planet is in orbit about the Sun and from a heliocentric point of view a fraction of the planet's orbital speed can be given or taken away from the spacecraft, depending on the geometry of the flyby. Many texts deal with the derivation of this in detail and an overview is given here. In Figure 2.4, a craft makes a close pass of a planet in planetocentric coordinates, viewed perpendicular to the B-plane.4 From the definition of a hyperbola, consideration of the angular momentum of the craft allows the periapsis of the craft to be found from its inbound trajectory.